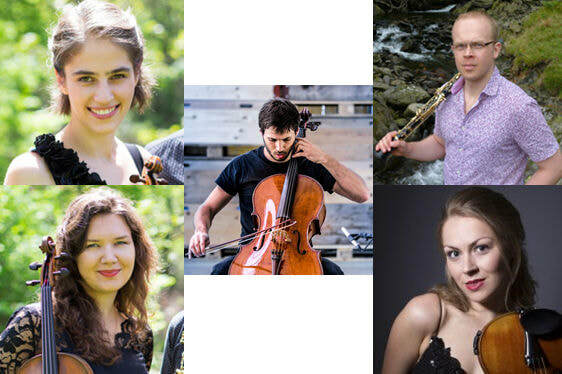 Ensemble Mirage is a dynamic flexi-ensemble based in London, UK, enabling the exploration and programming of the whole range of Clarinet-String-Piano chamber music, beginning primarily with the core three clarinet trios and building upwards. They were delighted to be selected for the 2016/17 St John’s Smith Square Young Artists’ Scheme and looked forward to presenting a rich variety of music and ensemble flexes in their programmes. Ensemble Mirage evolved from the award winning ensemble Trio Mirage, which formed in early 2014; with British clarinettist Matthew Scott, Hungarian violinist Júlia Pusker and Romanian pianist Alexandra Vaduva. Having met earlier in their studies at the Royal Academy of Music, they began exploring the diverse range of repertoire their trio setting offered. They soon won the Academy's Harold Craxton Prize and were awarded a 2015/16 Chamber Music Fellowship. During which they have worked with Academy composers to produce new works for the ensemble alongside chamber recitals.